"Tombstone is seventy-five miles from Tucson in a southerly direction: At times it is dusty, and my fellow passengers' tobacco smoke--three of them inside the coach, smoking like steam-engines--is not delightful, but all are good-natured and full of information, and I lived through it." Mark Macdonald (the Uraus-Major of the San Francisco Stock-Board), Senator Luttrell, and other lions are also traveling to see those eccentrically-named mines: the Lucky Cuss, Tough Nut, Contention, etc., which said mines with others, are now attracting almost National attention. Much of the road is over barren, uninviting country, the mountains in the distance everywhere are, however, all more or less mineral -bearing, but part of the road is through park-like country, oak and mesquit(e) trees, with miles upon miles of the finest kind of grass, extending to and up in the mountain-sides." The landscape has changed little except for plant life, as this photo shows. Much of the grass in this and other areas along the stage road is now gone, likely lost due to 20th century fire suppression of open ranges. Following the founding of Contention City, stage travelers rode past Drew's Station and then onto the fledgling town site to change horses and enjoy a brief break from the trip, before completing the journey to Tombstone. Given the stress on horses pulling both stage and passengers, Drew picked a strategic location for his station. It was 16 miles from Benson to Drew's and 11.5 miles from Drew's to Tombstone. 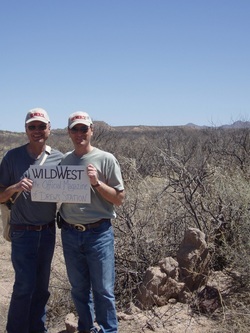 John Rose and Eric Weider hold up an impromptu sign that reads "Wild West The Official Magazine of Drew's Station." 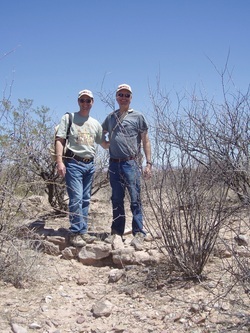 To the right of Rose and Weider at the bottom right of the photo is the last remaining portion of an adobe wall at Drew's Station. The foundation stone which once supported the adobe walls of the station are now all but gone. 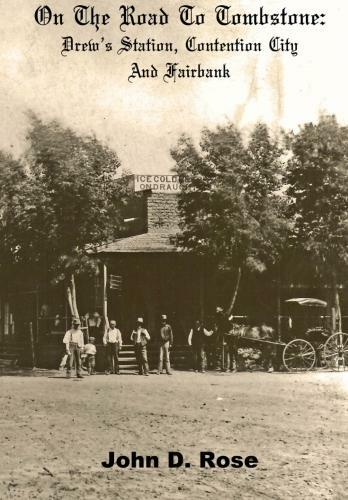 Prior to the inception of Contention City, Drew's Station was a key Stage stop when traveling to Tombstone, which at the time was one of the most promising mining camps in the American West. Per the Drew family, Mrs. Drew would bake pies that she sold to travelers while the station was active. The Drew family were not at all fans of the Earp family. Faint lines on the ground are all that remain of what was once one of the busiest roadways in the American West, traveled by Bat Masterson, George Hearst, John Clum, the Clanton's and McLaury's, Wyatt Earp and Doc Holliday among thousands of others who are not so easily remembered. John Rose points to the climb out of the wash that Bud Philpot was preparing to make when he was shot to death. 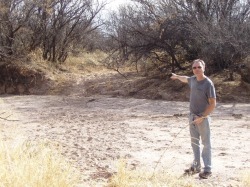 Philpot did not reach the other (northern) side of the wash alive to the area that John Rose is pointing to. Eli “Bud” Philpot was murdered, and Bob Paul refused the robbers command to halt saying instead “I hold for no man” and firing at them. Following the local press coverage in real time, this intriguing article entitled "A Forerunner" claims a Mr. Derre saw Luther King peer into the stagecoach in which he was traveling just before passing the ill fated Kinnear and Company stage but minutes before it was attacked and it's driver Bud Philpot murdered. The orange pin below closely approximates the area in which this encounter was described to have taken place. Luther King was one of the party of Highwaymen who attacked the stage. He was later captured by the Earp's north of Benson in Len Redfield's barn. Wishing to continue the chase for the other highwaymen, Virgil Earp turned King over to Sheriff Johnny Behan. Virgil would soon come to regret doing so as King was mysteriously allowed to escape from Behan's watchful eye. The blue pin next to the word wash marks where Philpot was murdered, and the yellow pin marks the location of the last remaining adobe wall of Drew's Station. Note that the Stage Road is still visible though overgrowth is rapidly reclaiming it. Even ten years ago the portion of the road that passed directly in front of Drew's Station(not visible in this satellite photo) was easily followed on foot, but not so today. John Rose stands at the last remaining wall at Drew's Station in the early to mid 1990's time frame. Note when comparing this to our other photos of the same wall it’s substantial amount of loss over the last fifteen years. in capturing the remaining stage attackers, and the unraveling of this secret deal will serve as a key catalyst to the gunfight near the O.K. Corral that following October. I wish to thank Craig Philpott, who graciously traveled back to the grave site of Bud Philpott at our request, to take these photos which now appear on our site. It's an important form of remembrance to not only show the location where Bud lost his life, but also where his remains were taken after that fateful journey on a March night driving a stage coach across the Arizona desert, and finally laid to rest. Craig shared with us the portion of the engraving which is still discernible which reads as follows: "Eli P. Philpott Died Mar 15 1881 AGED..." Following the word Aged, the numbers 27, 9, and 10 are legible, but the words that follow said numbers are not. Lawlessness caused by stolen cattle from those living along San Pedro River(Contention City was built along both sides of the San Pedro) is given voice in this letter by T.W. Ayles, a self described cattle dealer and butcher who has lost 50 head of cattle since his arrival. He notes losses of other ranchers larger than his, and further points to cattle raids in Mexico naming the "CowBoys" or other cattle thieves are the parties responsible. "Their seems to be an organized band," he writes, and adds that "their connections seem to extend to and over the Mexican border and to the borders of New Mexico and across both. Their late raids into Sonora may make that border to hot for them to cross..."
His point is prophetic, and would have been well headed by N.H. "Old Man" Clanton [whose son Billy Clanton would die at the gunfight near the O.K. Corral, as brother Ike fled for safety], along with others, who would die at the hands of Mexican's just after crossing the Arizona line in August of 1881, just five months after this was published. Though Ayles is living as a cattleman in Contention in March of 1881 when he wrote this, in 1882 Thomas Webb Ayles had moved to Tombstone, and had a change of career, working as a liveryman, likely in one of the corrals in Tombstone. Perhaps the raids on his stock and the shooting of Philpot induced such a move and career change. Ayles also adds news of the killing of Philpot, as he learned of it while writing the letter. Arizona Territorial Governor Frederick A. Tritle echoes Ayles claims of CowBoy depredations and their impact. He knew the area, as Tritle and his family had arrived in Tombstone in late 1880 and later opened a mining and stock brokerage firm along with William B. Murray, before becoming Territorial Governor. Back to Home Page Copyright 2012, 2013, 2014, 2015, 2016, 2017, 2019. John D. Rose all rights reserved.